Cooking again?! My Cuban Hash. I just ate, you mean I have to eat again? Cooking sometimes does feel like dishes and laundry. I’m dismayed I have to do it again. If only I ate out more. If only I was content to eat peanut butter toast day after day. If only I could bring myself to cook the same things every week. But I’m not like that. Somehow even when I really want to make it easy on myself I still make it too complicated. Last week I went a little batty trying to keep it simple. I knew I’d have time to cook only one giant meal. Anything else needed to take minimal energy and time. Somehow I found myself researching falafel recipes. Ha! No no no no. Back up. New things are not easy. I settled for buying some avocados and salad stuff and figured between that and eggs we’d figure out a way to put a dinner together in less than 15 min. I still cooked a massive load of Kym’s Cuban Hash. It’s intensely flavored. Super spicy balanced with super sweet and just a bit of bright tang from the green olives. I don’t bother sharing quantities because I don’t measure anything. Most of the things I cook are very forgiving and you could change the ratios or ingredients for your preferences. I only hope that you get an idea and make it your own. I make this all in my very large dutch oven, but you could probably improvise with whatever you got. Fried sweet potatoes in butter, brown sugar, maple syrup and black pepper. When potatoes were cooked, removed from pot and put aside. Added a little bit of oil and fried diced onions. Added fresh hot chillies (Anaheim and jalapeno), a bunch of minced garlic, and some chili powder. When the onions and chillies were nice and soft I added chorizo sausage (I love the stuff from the Seward Co-op). When the sausage was mostly cooked I added diced green bell pepper and collard greens. Added drained and rinsed black beans, golden raisins, and not enough green olives. Next time, I need more green olives. Will kept eating them before they made it into the pot. I also forgot to add a can of diced tomatoes. Stirred and covered until the green veggies were cooked. Stirred back in the sweet potatoes. Ta-da! Leftovers for the rest of the week. 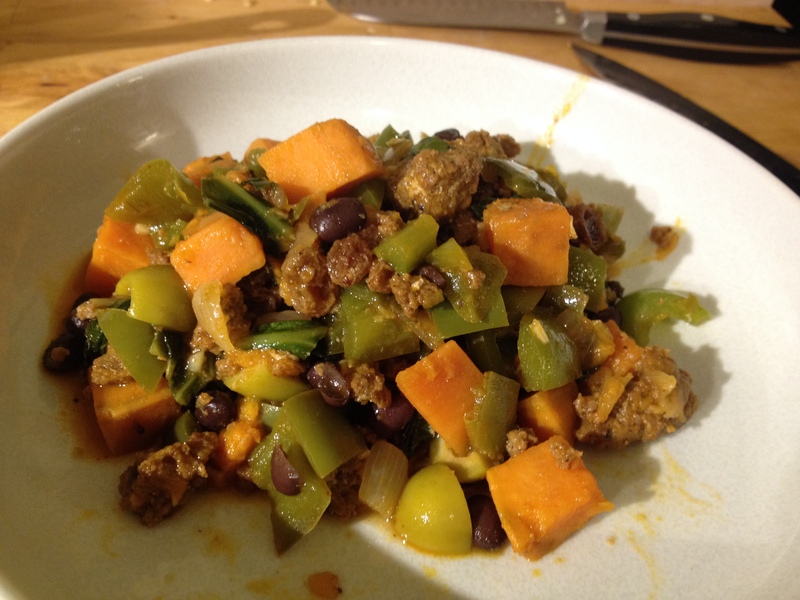 This entry was posted in Kym Cooked and tagged cooking, cuban hash, food, sweet potatoes. Bookmark the permalink.